I use VS 16 (non bt7) and use string savers. However, I don't put them in until after the string starts knotching a little bit. Then I will put them in the heavily knotched intersections. String savers definetly extend the durability of the string bed, but they also effect the playability a little bit. I do use string savers and put them on the sweet spot and use about 30. Shaun, do you put the string savers in your racquet before or after you play with it the first time you put in ng? 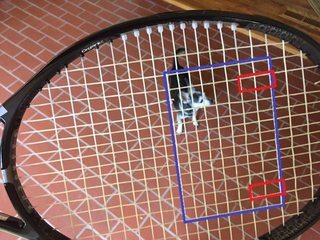 What do you think might be the problem with filling the racquet with string savers, or even with every other line? Don't do that.. It'll make the string bed stiffer and make you feel like you're hitting a metal ball. Just use some on the sweet spot. After all, gut is made for players looking for a soft comfortable feel on the string bed. Thanks Shaun. I'll remember that. My first thought on string savers was to put in quite a few to save the NG and have it last longer. What you said makes sense. Now to go back to my racquet (s) and take out a few string savers. It gave a few more hours of longevity without taking away from the gut's playability. I put on a whole bunch and it absolutely KILLED playability. I had very little spin even though my savers were babalot elasticrosses. I'm still experimenting... for now, I've put 2 in an area I usually break strings. As the gut starts to notch, I'll gradually add more. A diamond pattern was at one time recommended; it can vary too. Putting one ss at every other cross section in your pattern initially should do the job starting out. Yeah I don't like the stiffness in my VS Team 17 bt7 with string savers, but I do clean/wax my strings religiously after each hit (and my stringer waxes it before feeding it through the grommets as well) and that seems to extend its life by lot. TW has a "101 natural guide" that talks about this. Well, I wouldn't go as far into saving my money...B/c while I may get 2-4 months out my full bed natural gut, in average I only get 6 weeks and that's good enough for me. I do use 2-3 sticks alternating each 10 minutes (b/c of sweaty hands). When I use them, I only put them where I see the string starting to go and only after I get home. In other words, I'm not pulling the thing out of my sock like Sampras and inserting them between points. I don't believe string savers increase tension. Oh, they do. They're adding more space perpendicular to the strings, which effectively extends them leading to a stiffer stringbed. Do you have any empirical data to support that; i.e. how much "space perpendicular" and how much tension does that result in? Not sure if string savers do increase tension but putting in a lot will make you feel like you're hitting metal. Exactly: string savers negate the point of using natural gut. 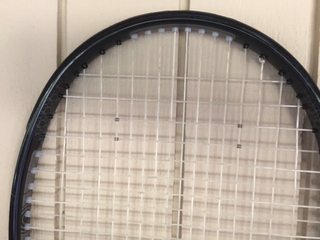 FWIW, the standard advice to racquet stringers at one point was to drop tension 2 lbs. if applying those right after stringing one. I don't think this referred to the densest possible pattern, though. I'd say no. I was talking theoretically and based on my experience with SS. But you're right in questioning how much effect the vertical offsetting really has and I have no numbers. Back when I had SS on, I measured the tension using the racquetTune iPhone app. I don't know how accurate the app is with SS (power pads, for example, seem to affect the measurements), but it was showing a kilo or two stiffer stringbed with SS. I always check my racquet tension before and after adding SS and it is always +.5-.6 lbs. I have never seen anything close to a kilo in string more than 100 racquets and adding SS. How many SS did you put? I recall installing something like 50 or 60. I don't dispute that the number of string savers you post might affect the feel of the string bed. Also keep in mind that the app you refer to uses sound as the determinant. I really think 2 kilos just from pieces of plastic that thin and further compressed by the string juncture after insertion is impossible. Holy cow! LOL I use 6 SS. No wonder we got different results. Yeah, I was experimenting a bit. Where do you put those 6? Do you use them to prolong the life of the gut or to help spin generation? I put them in the center, and spread them around in no particular pattern. I use them only to prevent the gut from breaking too early. They definitely reduce notching, and you don't have to use many for them to work IME. Thanks for the advice, Maui! I will be experimenting with fewer in the Prestige. Do any of you use a large/extensive SS patern like Mirnyi uses? I also notice that he uses them on consecutive strings, unlike Fed who skips a string between SS. Thoughts? When i use them I put in a whole pack of electrocrosses. Start at the top cross and do every intersection till i run out. That is with a locked cross string like nylon or kevlar. First used them with full kevlar and they helped increase spin and made the bed softer. Basically a big part of whether a string bed is soft is what happens to the mains on contact. With full kevlar or kevlar/nylon or any main with nylon, syn or natgut, or kevlar crosses the string bed gets locked. Adding electrocrosses will allow the mains to move more on contact which makes it play softer. Just the opposite happens with gut/poly where the electrocrosses slide less than gut/poly does on its own. Its the increased friction that makes things harsher rather than increased tension. Agree with rabbit that tension isnt increased. At least my Ert3000 never reported any difference. Interesting he puts them on consecutive mains, but every other cross. I have just put a few ss in my multi in the spot I consistently break the mains (tip/edge outside sweetspot ). I had the thought/question ... does a placed ss also protect intersections right next to it without a ss? I would guess "probably" up/down on mains like Mirnyi here. Seems less likely it would help a main left/right. The only logic/case for that might be two mains next to each other splay open from each other at contact. If you prevent/minimize one main's splaying/sliding ... maybe the main next to it without a ss also slides/splays less. Aren't you a math guy ... work that out for us. Like @Shroud said ... sliding effect of ss must vary per string type (maybe more with gut, less with poly). I only played fb gut, and just chased the frays. I would think how you notch/break would dictate ss usuage. I tend to get a few bad notches, but rest of strings look pretty good. For me, doesn't make sense to put pattern in center ... hence my "ss after stringing in bad spots". Seems to be working ... at 9 hours virtually no mains notching above or below ss. I had the thought/question ... does a placed ss also protect intersections right next to it without a ss? I would guess "probably" up/down on mains like Mirnyi here. Seems less likely it would help a main left/right. The only logic/case for that might be two mains next to each other splay open from each other at contact. If you prevent/minimize one main's splaying/sliding ... maybe the main next to it without a ss also slides/splays less. I have recently been experimenting with different SS patterns with fb gut. I'm going to try Shroud's method with 12x12 section of my stringbed, using SS on every intersection. Have you played enough with gut now to indentify a "break zone for you"? Here is what I mean: let's say you always break mains, and between cross 4 thru 6. If it was me, I wouldn't insert ss in the additional 9 crosses just for "feeling or consistency" reasons, particularly with fb gut. I think fb non-slippery gut or fb non-slippery multi are the best candidates for ss (just thinking logically ... have not used them myself other than chasing the frays, and now minimum location). So say fb bab vs or fb xcel. Soft ... not slippery ... doubt you need the full 12 rows for consistency/feel reasons. Also ... upside is less " (It definitely feels different with 12x12 block of SS!) ". I feel different about using ss in fb velocity. I like the way v plays partly because it's slick. I absolutely would not step on that with rows of ss. I will add pics below on an example break, and current ss experiment. For 40 years I have broken 3rd or 4th main ... more toward tip generally. I will post pics below. Blue - my hitting zone based on notches (I don't think I ever hit near throat or bottom edge, so the hitting zone is more narrow than the blue depending on which edge is up). Red - seems to be my big notch zone ... hence the strange looking ss test below. Interestingly ... even with only those 4 bab ss, I seem to feel the difference when I hit near them (maybe like a vibration, slightly stiffer). Probably in my head, but I look at that as a "teaching aid" ... "don't hit f***** up there". Actually ... might be good to fill all of the 2nd, 3rd and 4th cross for that "teaching thing". 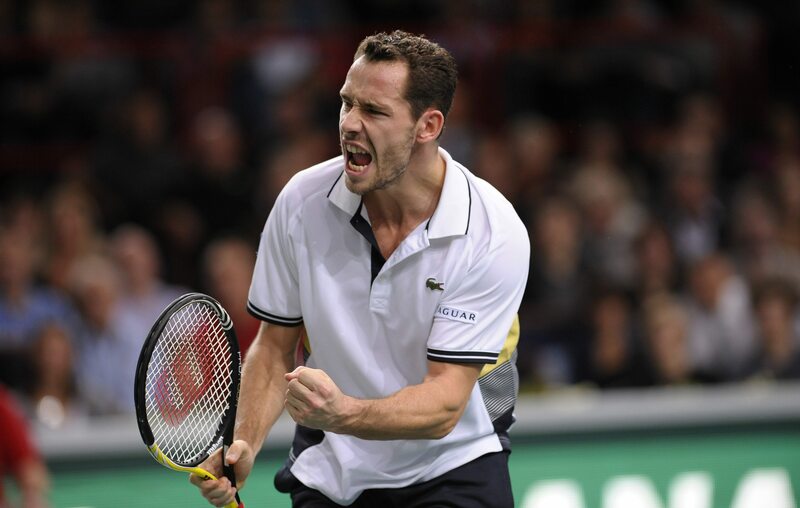 More Llodra photos (one of the last ATP pros that I'm aware of to use fb gut). Weird he doesn't start from the same main from both edges. Maybe he is whack like me ... and plays with one edge up all the time. No way at that tension it "fell out"